Below are the rules stated by the league committee. These rules are to be followed to help ensure a fair yet enjoyable league. Any problems, queries, or questions speak to your captain first as they should know what to do (or how to resolve any irregular issues). All teams shall play all other teams in their own division twice per season, i.e. Home & Away. Matches shall consist of seven games - two doubles & five single. Each player may play once in singles and or once in the doubles. A Captains game shall be played at the start of each league match. At the start of the match each captain will write down or have available his team players names. The opposing Captain will select the order of play, and opponents in both doubles & singles. The team Captains will be responsible for selection of his/her doubles pairings prior to the draw taking place. Matches shall be played on Thursday evenings & begin no later than 8:30 PM. No games may be claimed (for late start) until 8:45 PM. In the event of postponed games (see rule 8), date & time will be decided by the opposing Captains. The Home Team shall provide the table money & scorer(s). The Away Team shall provide the checker(s). If one or more players is not present when the draw is made, their game(s) shall be put back until all other games have been played, except at the discretion of both Captains. If player(s) are still absent when all other games are completed, the Captain may seek substitute(s) provided that rules 2 is not contravened. If a substitute is not available, the game shall be forfeited to the team whose player is available. In the event of a team failing to forfill a fixture, that team's opponents shall be awarded Two Points & shall be deemed to have won the match by Seven (7) games to Nil (0). CANCELLATION OF MATCHES : - In the event of a team unable to forfill a fixture, notification must be given to the other team concerned, not later than Eight (8) days before that fixture. If exceptional circumstances occur, the committee will be the adjudicators whether or not the reason is justifiable. Any cancelled matches must be played as soon as possible. A blank date will be left prior to the last match of the season to enable any postponed matches to be played. In the event of two teams being unable to arrange a date to play a rearranged match, the committee will appoint a date a date when the two teams will be required to complete the fixture. Failure to do so will result in the offending team being adjudged to have lost by 7 games to 0. Should any team withdraw from competition before all the fixtures have been completed, all of that teams matches and games played in the current season, shall be disregarded, & all scores of those matches & games be null & void - League positions will then be adjusted accordingly. Two Points shall be awarded to the team winning the best of Seven Games in the event of a Drawn Match, each team shall be awarded One Point. If two or more teams have the same number of points, league positions shall be determined by number of individual games won. Each team shall pay to the league a registration fee to be fixed at the committee meeting or A.G.M. prior to the start of the season. Fees are payable before the first match of the forthcoming season. Players are automatically registered for a team for that season when they first play for that team. Each team shall complete, & each visiting Captain sign a score sheet which is to be returned to the address shown at the foot of the result sheet by the winning team not later than the Sunday following the match. All teams should keep a record book of all matches played with individual scores & high breaks. In the even of a dispute agreement must first be sought by the opposing Captains, the scorer & checker. If agreement cannot be reached, disputes may be taken to the committee within Three Days of the game/match so disputed. Complaints must be in writing & accompanied by a £0.50p disputes fee, to be refunded if the complaint is upheld. No player may transfer to another team within the league during the current playing season. However if a team withdraws from the league, (that team's results will become null & void), the players of that team may then play for any other team, since nullifying their game results signifies that they have not competed. Where more than one division is formed for a season there shall be a "two up - two down" system of promotion & relegation. The funds of the league shall be deposited in a bank account with three signatories. Two signatories must sign all cheques. Accumulated funds of more than £20.00 (after a working balance is achieved) must be transferred to a deposit account under the same conditions as rule 19. The name of the league shall be Sudbury & District Bar Billiards League, & its officers & committee shall be appointed annually at an Annual General Meeting. The officers shall consist of a chairman, secretary, treasurer & such others as the AGM may decide to appoint. The committee shall consist of such members as the AGM decides to elect. Auditors shall be appointed at the discretion of the committee. The AGM will be held after the completion of the league season & prior to the commencement of the following season, unless otherwise decided by the membership at an extraordinary meeting. Interim business will be dealt with by the committee, which will meet as necessary. Members of the league may call a general meeting if more than Ten Members wish to do so. Members may also request a committee meeting if more than two members wish to do so. All other business of the league shall be conducted in accordance with the wishes of the AGM. The league may expel any member who is adjudged to have deliberately disregarded the rules of the league if such action is called for by a majority of the membership. In doubles knockout competitions, played either within or, under the auspices of the league, if a player becomes unavailable to play due to circumstances the remaining player may select a new partner, providing that new player has not played previously in any stage of that competition. No opposing team players shall Move or Adjust the table unless a specific request is made from either members of the Home Side or the Landlord. The "Highest Break" competition shall include singles and doubles games in league matches only. The "Highest Score" competition will only include single games played in league matches. Where players who have qualified in either Singles or Doubles competitions are unavailable to take part in the Finals Night Competitions, their place will be taken by the beaten finalist/s. In competitions where points are awarded towards an individual trophy or an individual qualification, only league single matches are applicable. Two points shall be awarded for a singles win and one point for a drawn game. Entrants to have played in at least one league game. The Steve Richardsons Charity Doubles Competition shall be open to any players provided they are of an age permitted at the competition venue/s. In the Landlords Cup the Licensee or a paid member of staff will be eligible to enter this competition. In all matches, a coin shall be tossed to determine the order of play. The away player to call. To start the game, place the red ball on the spot above the 'D' and play a white ball from the centre of the 'D'. The centre of the 'D' should be marked with a spot. Thereafter, with the exception of further break shots, and the last ball, the cue ball may be played from any position within the confines of the 'D'. All strokes throughout the game must be played from the 'D'. The player must not play the cue ball directly into a hole. The cue ball must first strike another ball to become a scoring shot. When the red ball is sunk, the score of that ball is doubled. The red ball must then be played from the 'D'. When all balls are in play, and none left in the tray, the ball nearest to the baulk line is returned and played from the 'D' to continue the game. If two or more balls are equidistant from the baulk line the ball nearest to the centre should be returned to continue play as it is "nearest to the D". When no balls are left in play, the red and white balls are positioned as for the start of the game. When a ball returns to the baulk area, that ball is removed to the tray. If a peg is knocked over by a ball and cannot be replaced because of obstruction by a ball, that ball shall be removed to the tray. The peg must be replaced to its correct position. If a peg is knocked from its correct position without falling over, it shall remain in that position until the player has concluded his/her break. It will then be replaced correctly. If the ball is touching the peg, and the peg has not been removed from its correct position, that ball shall remain in play, and NOT be removed from the table. If a ball and peg are wedged in a hole together, the peg is to be removed first and the ball allowed to drop down the hole and not returned to the tray even after the gate has dropped. If 2 balls are balanced/wedged in a hole they will be left in their position until they are potted. If one of these balls is required as the nearest ball both balls shall be removed from the table and returned to the tray. 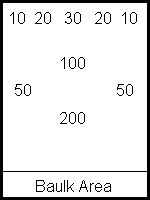 Each player continues until a non-scoring shot is played. Once a player leaves the table their break is deemed over, should a ball fall down a hole after they have left the table this will not count towards their break or their opponents break unless their opponent has first struck the cue ball whether or not it strikes another ball. Scores shall have the same value before and after the gate has dropped. The red ball will continue to score double. The last ball on the table shall be played from the centre of the 'D', into any hole off any cushion. If the last ball is correctly played, but not holed, the player keeps the score of that break. The player, or pair of players in doubles games, with the highest total score at the end of the game, will be deemed the winner/s. In the event of the scores being equal the game will be drawn and each team will be awarded half a game. (One point) each. The last ball is holed without striking a cushion. The player causes the peg covering the 200 hole to be knocked over. The cue ball fails to strike another ball. Any ball returns to the baulk. (The 'D' counts as baulk). The same break shot is played more than three times in succession. The player causes any peg, other than that covering the '200' hole, to be knocked over. The player fails to play the red ball when it is available. Any ball leaves the table, or strikes the backboard, even if that ball returns to the normal play area. Any ball is played other than from the 'D'. The player causes any ball to move other than a shot played correctly from the 'D'. If a break shot or final ball is not played from the centre of the 'D'. If a combination of foul shots occur, then, regardless of sequence of events, the player shall suffer the greater penalty. Pegs shall be placed to cover the 200 hole, the 100 hole, and the two 50 holes and all league tables will have circles marked around the pegs so it is visible to all when pegs are not in their correct positions. The spot for the red ball for the break shall be exactly halfway between the rim of the 200 hole closest to the baulk line, and the baulk line. The number of balls shall be six white and one red. Tables must be maintained in good condition, and spare cues and chalk must always be provided.